You will need Node 8.9+ and Yarn installed on your machine. In this tutorial, we will examine at how to use Tensorflow.js and Pusher to build a realtime emotion recognition application that accepts an face image of a user, predicts their facial emotion and then updates a dashboard with the detected emotions in realtime. A practical use case of this application will be a company getting realtime feedback from users when they roll out incremental updates to their application. With the rapid increase in computing power and the ability of machines to make sense of what is going on around them, users now interact with intelligent systems in a lot of their daily interactions. From Spotify’s awesomely accurate discover weekly playlists to Google Photos being able to show you all pictures of “Gaby” in your gallery after identifying her in one picture, companies are now interested in ways they can leverage this “silver bullet” in their service delivery. The best part of this is that recognizing a users emotion happens right on the client side and the user’s image is never sent to the over to the server. All that is sent to the server is the emotion detected. This means, your users never have to be worry about you storing their images on your server. Let’s get to the good stuff now! Follow the prompt to create the application using the using the Vue Router preset. This creates a starter Vue.js project which we will then update to fit our application. To get users’ images and feed them to our model, we are going to make use of the a webcam class. 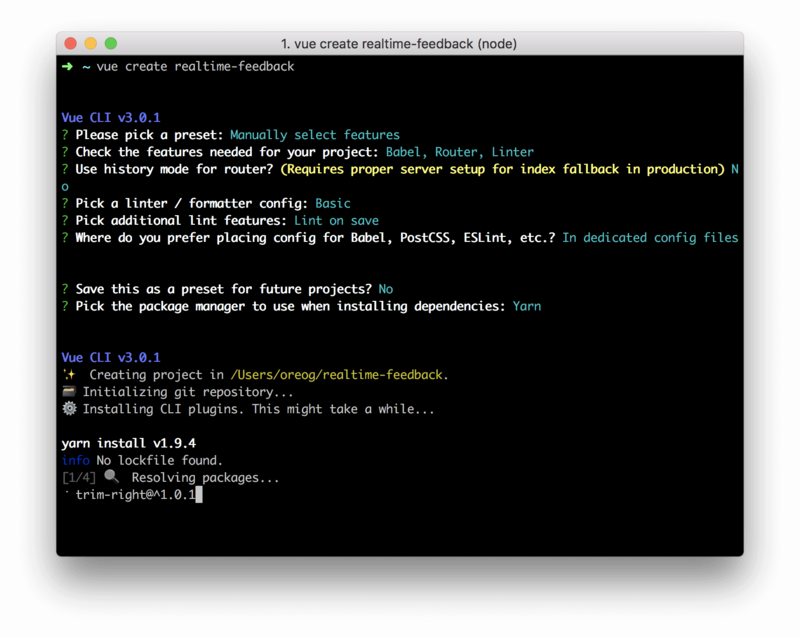 Fetch the file from here and add it to your realtime-feedback/src/assets directory. Afterwards, go ahead and ahead and get the Pusher logo from here and place it in the realtime-feedback/src/assets directory. When this component is mounted, a webcam is loaded and the user can now actively see what is going on from their camera. Homepage, where users will interact with and take pictures of themselves. Dashboard, where you can see a summary of the emotions recognized in realtime. On the homepage, there are two basic modes, train mode and test mode. To give us the ability to successfully recognize emotions, we are going to make use of a pretrained MobileNet and pass the result from the inference to train KNNClassifier for our different moods. In simpler terms, MobileNet is responsible for getting activations from the image and the KNNClassifier accepts the activation for a particular image and predicts which class the image activation belongs to by selecting the class the activation is closest to. More explanation on how predictions are generated will be shared later on in the article. If the selected mode is train mode, the camera module is displayed and a dropdown is presented for the user to train the different available classes. If the test mode is selected, the user is then shown a button prompting them to take a picture of their face and allow the model predict their emotion. First import the Camera component, the Tensorflow.js library, the MobileNet model and the KNNClassifier. There are also other models available open source on the Tensorflow Github repository. classifer - which will represent the KNNClassifier. mobilenet - which will represents the loaded MobileNet model. class - which represents the class to train. Used in train mode. detected_e - which represents the emotion that model predicts. Used in test mode. mode - which represents what mode is in use. When the component mounts on the DOM, the init() function is called. This creates an empty KNN Classifier and also loads the pretrained MobileNet module. When the trainModel() is called, we fetch the image from the camera element and then feed it to the MobileNet model for inference. This returns intermediate activations (logits) as Tensorflow tensors and then add it as an example for the selected class in the classifier. What have just done is also known as transfer learning. Let’s take a look at the methods that are called when in the test mode. When the getEmotion() method is called, we fetch the image and also obtain logits. Then we call the predictClass method of the classifier to fetch the class the image belongs to. After the emotion is obtained, we also call the registerEmotion() that sends the detected emotion over to a backend server. Notice here that the users image is never sent anywhere. Only the predicted emotion. We need a way to be able to trigger realtime events in our application when a new emotion is predicted. To do this, let’s use Pusher. Pusher allows you to seamlessly add realtime features to your applications without worrying about infrastructure. To get started, create a developer account. Once that is done, create your application and obtain your application keys. We create a simple Express application, then initialize Pusher using the environment variables specified in the .env. Afterwards, we create a simple /callback route that is responsible for triggering a new_emotion event on the emotion_channel with the detected emotion passed as the body. The component only has one function init() which we call when the component is mounted. The function creates a new Pusher object, subscribes to the emotion_channel and then listens for a new_emotion event and then updates the feedback summary on the dashboard in realtime without any need to refresh the page. Note: You’ll need to replace PUSHER_APPKEY and PUSHER_APPCLUSTER with your application key and cluster. When you head over your application and navigate to http://localhost:8080 in your browser to view the homepage. Open the http://locahost:8080/dashboard route in another browser tab so you can see your results in realtime on the dashboard. In this tutorial, we went through how to create build a realtime emotion recognition application using Pusher, Tensorflow and Vue.js in the browser without needing to send the image of the user to any external service. Feel free to explore more on machine learning and play with some awesome demos here. Here’s a link to the GitHub repository. Happy hacking!